Close out #ScaryMovieMonth with Patrick and Mike as they do their thing on the entire Texas Chainsaw franchise. Confession: I mainly wrote that Captain Kirk Halloween review with Mike in mind. I'm glad you appreciated it! 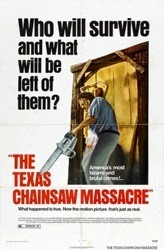 I'm also sad that we won't be seeing the sequel "Leather Babies," featuring chainsaw-wielding babies. I think it's only 4 movies (5 if you count the remake), but you could do the Psycho series next year. But I think I like the Living Dead franchise idea. P.S: Thanks for brining it with so much great content this month. It all helped to make this a SMM like no other that has come before it, and the best one yet! This is my favorite podcast every year, I look forward to it so much. Great job again boys. Texas Chainsaw 3D is set today - there are mobile phones and modern music; what they've done is bring the events of the original film twenty years forward. There's a brief shot in the movie of a gravestone with the year deliberately blocked by plants or something so they don't directly reference that the events of the original now apparently took place in 1994, but that's the only way it makes sense.